Follow the directions in Create your first function from the Azure portal and don't do the Clean up resources step. That quickstart creates the function app and function that you use here. Install Microsoft Azure Storage Explorer. This is a tool you'll use to examine queue messages that your output binding creates. In this section, you use the portal UI to add a queue storage output binding to the function you created earlier. This binding will make it possible to write minimal code to create a message in a queue. You don't have to write code for tasks such as opening a storage connection, creating a queue, or getting a reference to a queue. 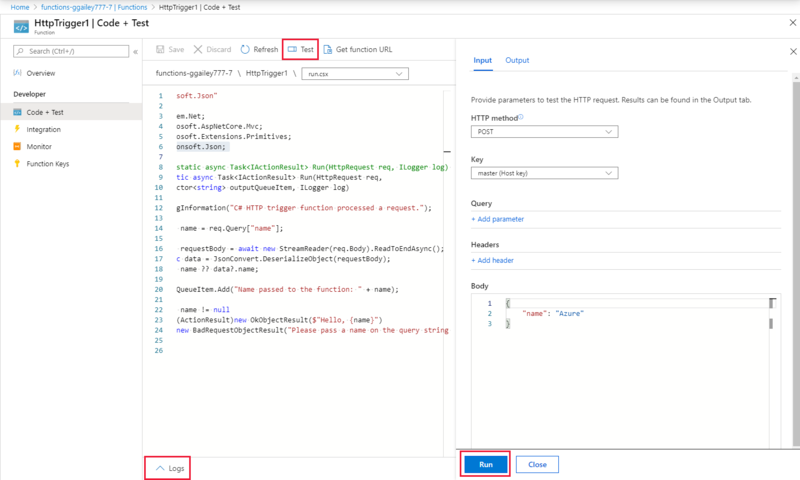 The Azure Functions runtime and queue output binding take care of those tasks for you. 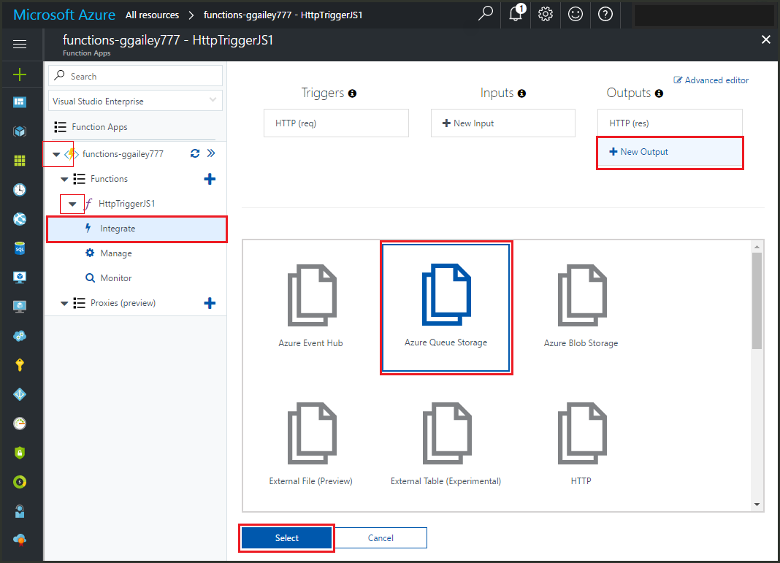 In the Azure portal, open the function app page for the function app that you created in Create your first function from the Azure portal. To do this, select All services > Function Apps, and then select your function app. Select the function that you created in that earlier quickstart. Select Integrate > New output > Azure Queue storage. If you get an Extensions not installed message, choose Install to install the Storage bindings extension in the function app. This may take a minute or two. Message parameter name outputQueueItem The name of the output binding parameter. 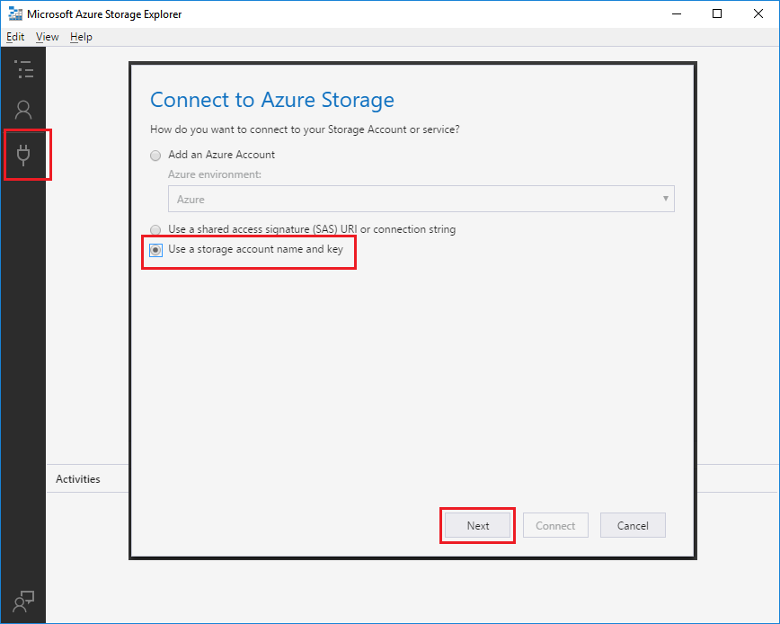 Storage account connection AzureWebJobsStorage You can use the storage account connection already being used by your function app, or create a new one. Queue name outqueue The name of the queue to connect to in your Storage account. Click Save to add the binding. Now that you have an output binding defined, you need to update the code to use the binding to add messages to a queue. In this section, you add code that writes a message to the output queue. The message includes the value that is passed to the HTTP trigger in the query string. For example, if the query string includes name=Azure, the queue message will be Name passed to the function: Azure. Select your function to display the function code in the editor. Add an outputQueueItem parameter to the method signature as shown in the following example. In the body of the function just before the return statement, add code that uses the parameter to create a queue message. Add code that uses the output binding on the context.bindings object to create a queue message. Add this code before thecontext.done statement. After the code changes are saved, select Run. Notice that the Request body contains the name value Azure. This value appears in the queue message that is created when the function is invoked. As an alternative to selecting Run here, you can call the function by entering a URL in a browser and specifying the name value in the query string. The browser method is shown in the previous quickstart. Check the logs to make sure that the function succeeded. A new queue named outqueue is created in your Storage account by the Functions runtime when the output binding is first used. You'll use Storage Explorer to verify that the queue and a message in it were created. Skip this section if you have already installed Storage Explorer and connected it to the storage account that you're using with this quickstart. 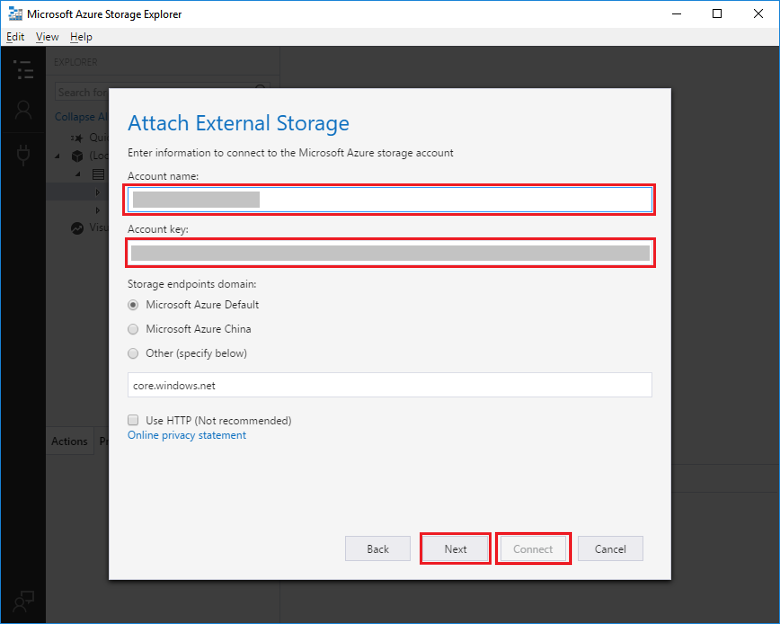 Run the Microsoft Azure Storage Explorer tool, select the connect icon on the left, choose Use a storage account name and key, and select Next. In the Azure portal, on the function app page, select your function and then select Integrate. 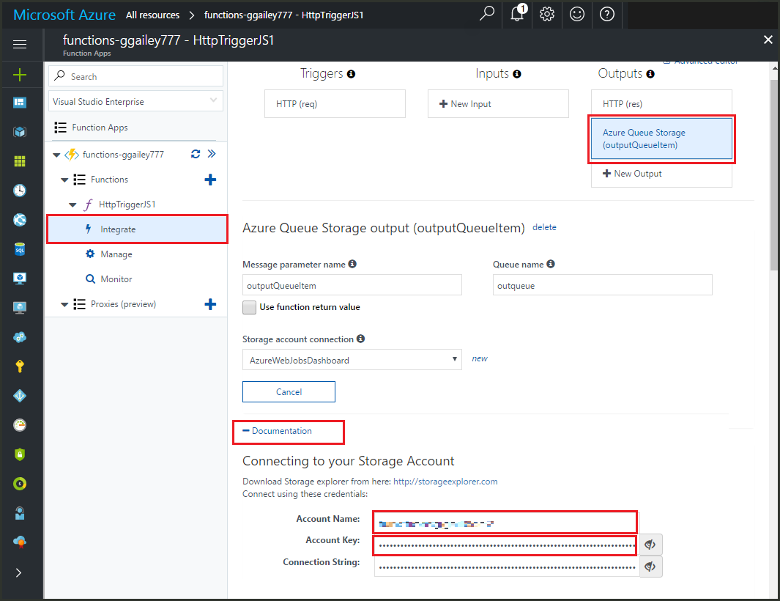 Select the Azure Queue storage output binding that you added in an earlier step. Expand the Documentation section at the bottom of the page. 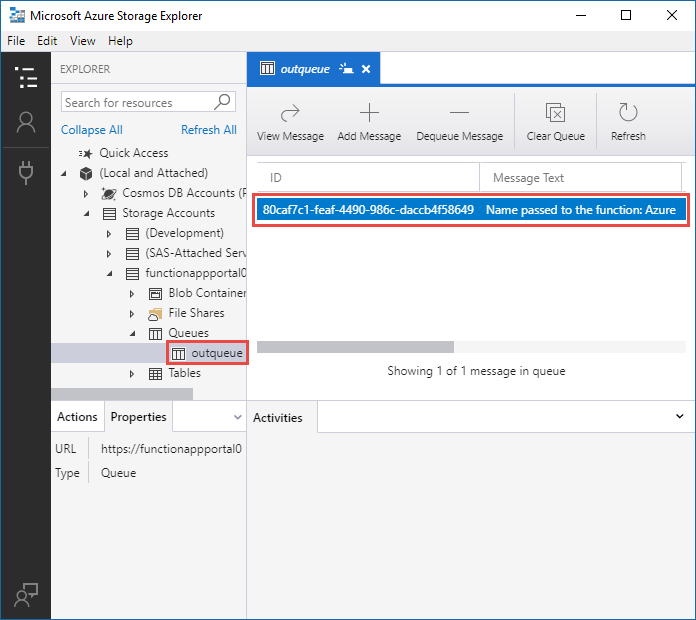 The portal shows credentials that you can use in Storage Explorer to connect to the storage account. Copy the Account Name value from the portal and paste it in the Account name box in Storage Explorer. Click the show/hide icon next to Account Key to display the value, and then copy the Account Key value and paste it in the Account key box in Storage Explorer. In Storage Explorer, select the storage account that you're using for this quickstart. Expand the Queues node, and then select the queue named outqueue. The queue contains the message that the queue output binding created when you ran the HTTP-triggered function. If you invoked the function with the default name value of Azure, the queue message is Name passed to the function: Azure. Run the function again, and you'll see a new message appear in the queue. In this quickstart, you added an output binding to an existing function. 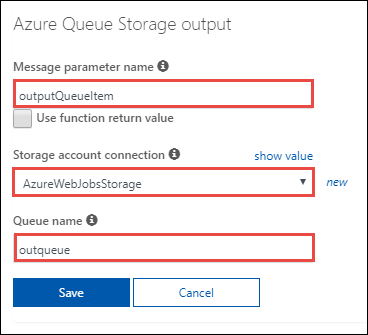 For more information about binding to Queue storage, see Azure Functions Storage queue bindings. Learn how Functions integrates with other services. Provides more technical information about the Functions runtime and a reference for coding functions and defining triggers and bindings. Describes the options for developing your functions locally.